Learn what to use when you need a delicious Paleo-friendly food option in the Paleo Substitutions Guide below! Whether you’re looking for quick substitutes or want to add new foods to your meal-making arsenal, this Paleo Substitutions Guide (and handy infographic!) will help you swap out no’s for yes’s with ease. But before we get into the Paleo substitutes, let’s do a quick refresh on the diet itself. In essence, the Paleo diet is a way of eating that’s similar to how ancient humans ate. In other words, if our ancient ancestors were able to hunt or gather it, we can (and should) eat it. The concept behind this is that the “modern diet” has been influenced by agricultural and commercial industries to include foods that are not the most appropriate, natural, or healthy options, and that by “getting back to our roots” with a diet that consists of natural, unrefined foods, we can provide our bodies optimal nutrition and health. Fruits. Bananas, apples, oranges, etc. Nuts. Macadamias, almonds, pecans, etc. Vegetables. Broccoli, spinach, tomatoes, etc. Seeds. Sunflower, pumpkin, pomegranate, etc. Proteins. Pork, eggs, beef, seafood, poultry, wild game, etc. Healthy Fats. Olive oil, coconut oil, grass-fed butter, ghee, lard, etc. Some dairy. Milk, cheese, sour cream, yogurt, cream, etc. Dairy products such as grass-fed butter and ghee are allowed on Paleo. Legumes. Peanuts (and peanut butter), soy, navy beans, black eyed peas, kidney beans, pinto beans, etc. Grains. Wheat, oats, rye, corn, barley, brown rice, bread crumbs, etc. Highly processed oils. Canola oil, vegetable oil, margarine, etc. Sugary snacks and drinks. Sodas, some fruit juices, packaged snack foods, etc. Now that you know what foods are on and off the table, you’re one step closer to Paleo success! Next up, the substitutes. Below, we’ve compiled a list of off-limits foods to show you how to creatively swap them for delicious Paleo-friendly options. For easy reference, print out the handy infographic below to hang in your pantry or kitchen! This Paleo ingredient substitutions guide shows you what to use when you need delicious Paleo-friendly foods. Learn what ingredients to use when you need delicious Paleo-friendly alternatives with our free Paleo Substitution Guide! The good news about the Paleo diet is that since it focuses on simple whole foods, most of the ingredients you’ll need are available at your local grocery store or farmer’s market; you don’t have to add a lot of specialty items to your pantry. But if you do have trouble tracking down an item, we recommend checking out online stores like Thrive Market to stock up on substitutes as well as popular Paleo ingredients like bone broth, avocado mayonnaise, and coconut aminos. For a list of Paleo pantry essentials, check out our guide. Yogurt and sour cream. Coconut yogurt or almond yogurt. Cream. Coconut cream or cashew cream. Cheese. Cashew cheese or nutritional yeast. Milk. Coconut milk or nut milks (cashew, macadamia, almond). Corn. Tomatoes or vegetables chopped small (mushrooms, carrots, bell peppers). Noodles or pasta. Spiralized veggie noodles (zucchini, sweet potato, butternut squash, carrot), spaghetti squash, kelp noodles, or shirataki (yam) noodles. Rice or other grains. Cauliflower rice or plantains. Flour. Coconut flour, almond flour, arrowroot powder, or tapioca flour. Breadcrumbs. Flax meal, chia seeds, ground pepitas, ground nuts, almond flour. Tortillas. Coconut-based tortillas, lettuce or cabbage wraps. Pizza crust. Cauliflower crust, portobello mushrooms, zucchini boats, Italian eggplant sliced into rounds, or sweet potatoes sliced into rounds. Beans. Vegetables chopped small (mushrooms, carrots, bell peppers) or proteins like chicken and eggs. Edamame. Chopped green beans or vegetables chopped small (broccoli, bok choy, peas). Peanuts. Cashews, pistachios, pine nuts, or walnuts. *Note: Wheat gluten is often found in foods you would never expect to find it in. So it’s a good idea to check your food labels when you’re just starting the Paleo diet to avoid wheat additives and sneaky soy. Canola or soybean oil. Avocado oil, coconut oil, olive oil, grass-fed butter, or ghee. Sugar. * Maple syrup, honey, stevia. Peanut butter. Almond butter, sunflower seed butter, or cashew butter. *Note: Although many Paleo ingredients overlap with the Whole30 diet, added sugar, even natural options like maple syrup and honey, are not Whole30 compliant. To learn more about the Whole30 diet and how it’s different from Paleo, read our article here. Potato Chips. Kale chips, brussels sprout chips, or plantain chips. French fries. Sweet potato fries, parsnip fries, or carrot fries. Cheese or dip. Baba ganoush, roasted red pepper sauce, or coconut yogurt with lemon and herbs. Pasta meals. Dress sauce over a chicken breast, chop vegetables (zucchini, cauliflower, turnips, mushrooms, cabbage) into pasta length and use the same sauce, or use a spiralizer to make veggie noodles (zucchini, sweet potatoes, carrots, turnips). Tacos. Use a lettuce leaf or a cabbage wrap, enjoy filling over a baked sweet potato, or turn into burrito bowls by serving toppings over cauliflower rice. Burgers. Serve patty over a bed of mixed greens, wrapped in lettuce, or over roasted portobello mushrooms. Or, serve ground meat over a baked sweet potato. 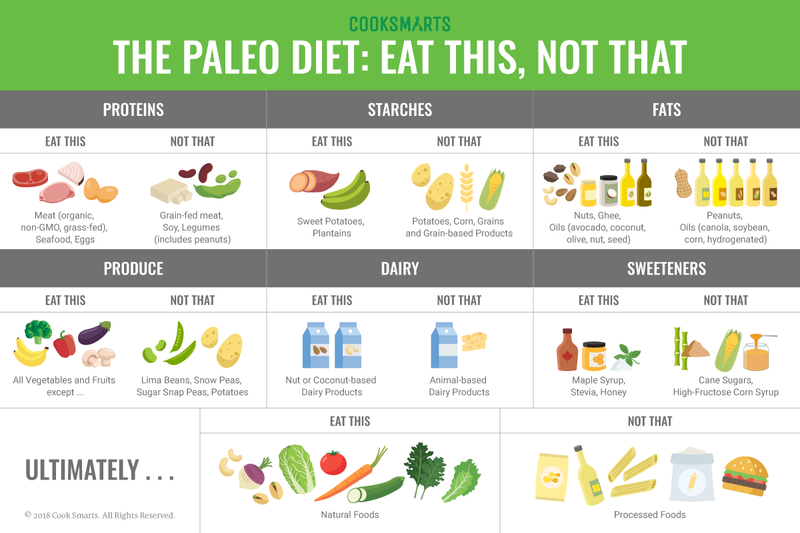 Now that you know what to eat, what not to eat, and what foods to swap out for Paleo-friendly options, there’s only one step left: how to use a Cook Smarts meal plan on a Paleo diet! You get a weekly Paleo menu. You select the Paleo meals you want to make and the serving sizes. All of our meal plans come with three versions — original, Paleo, and gluten-free — so if you have family or friends who aren’t keen on Paleo, you can instantly adjust your meals to fit their tastes. Pretty simple, eh? Who says eating like a hunter-gatherer has to limit your creativity in the kitchen? Do you enjoy the Paleo diet? Any Paleo substitutes you want to share? Let us know in the comments! For more substitution smarts, check out our Cooking Ingredient Substitutions. And if you would like more cooking tips and resources sent straight to your inbox, sign up for our newsletter below, and we’ll help you raise your kitchen IQ and cook with confidence! Note: This isn’t a sponsored post, but if you do end up signing up for an annual membership at Thrive Market, we’ll make a small affiliate commission. This helps us continue our mission of delivering lots of smart cooking info to you, all for free. Make cooking and eating paleo even easier - get all this info in your inbox!